Making history in the annals of local sports, a T20 over Cricket Match was held between Sri Lanka's Northern and Eastern Province Combined Team Vs Melbourne's Ferntree Gully District Cricket Association & Australian Hellenic Federation Combined Cricket Team recently. The match was played at the Kilinochchi Central College playground. The Kilinochchi Central College play ground was packed to capacity with school children, sports enthusiast and the general public who had come in their numbers to witness this historic event. Having won the toss, the local team opted to bat first. Their strong batting line up ended up scoring 174 for six wickets at the end of the innings. A.L Nadeeshan's knoch of fifty immensely contributed to the local team's score card. Chasing the home team the visiting Australians were routed out for a mere 104 runs in just 19 overs. Well executed bowling and excellent fielding by the local lads led to the downfall of the young Australians. It was a show of emerging young talent of the once war ravaged North and East. During the match 84 school children of Kilinochchi were distributed with brand new push bicycles by the Foundation of Goodness with the generous contribution by former national skipper Kumar Sangakkara. 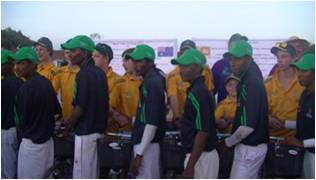 The North- East combined cricket team members were also given with a push bicycle making it a total of 100 numbers. It was a historic and a victorious moment not only for the young Cricketers but also for the people of the North and East. This single event stand testimony, though having had to go through many hardships in life and almost losing all future hopes about a better future due to Terrorism and Violence, the enduring desire, unmatched courage and the mental robustness of the people of Sri Lanka to meet the challenges in life with a positive attitude of mind and their ability to be victorious at the end. It is also an indication to affirm that normalcy and peace has dawned on Sri Lanka and the people of the North and East are at last fortunate enough and privileged to join the mainstream society thus to live with dignity and pride. The victory over visiting young Australian Cricket Team is so significant that it led to inspire, encourage and to establish new hopes and dreams in the hearts and minds of many thousands of youths in the former conflict zone. The transformation taking place today in the North and East and particularly in Kilinochchi is unprecedented. It was also a moment of joy and happiness for all the security forces personnel in Kilinochchi as well. It was the Military Troops, who did the impossible to rescue the people in Kilinochchi and elsewhere from the clutches of Terrorists and now continued to do so silently all what is possible to help rebuild the life and society in North and East of Sri Lanka. It was the Military Troops in Kilinochchi who organized the colorful Cricket Match under the leadership of Kilinochchi Security Force Commander Major General Udaya Perera with the sincere assistance of Foundation of Goodness. The event also send a strong message to the extremist elements, local and international that youth in North and East are better-off without ethnic tensions, racial hatred and conflict and they are much concerned and privileged to live in a peaceful society. Depriving the rights of children is the most heinous crime humans could commit against humanity since destroying the childhood permanently endangers the future prosperity of a society. Therefore extremist's elements should understand before spreading communal hatred, idea of separation and disharmony what they are about or willing to sacrifice. The North and East combined Cricket team is the next best example after Sri Lankan National Cricket Team to tell the world how best we could achieve National Consensuses and Harmony through sports. Both the team represents all ethnicities in Sri Lanka is a point to note. The presence of the Australians in Kilinochchi was an inspiration to all the courageous people in Kilinochchi which brought recognition and pride to the society. It gives a very clear indication to the world that Kilinochchi is open to all be it local or International thus safe and secure.